The admission price includes a meal and beverage. 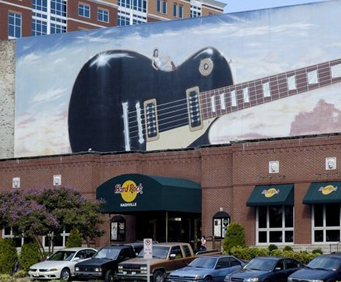 Treat yourself to a hearty Hard Rock Cafe meal as you gaze at Garth Brooks' hat, Jimi Hendrix's shirt, and other fantastic music memorabilia! Other memorabilia includes Hank Williams Jr.'s suit, Michael Jackson's shoes, a microphone from the band Paramore, and guitars from Randy Travis and Kenny Chesney. Being that the city is the financial and insurance center of the South, the "Athens of the South" with several acclaimed schools (and its own replica of the Parthenon), a major sports center with the Tennessee Titans and Nashville Predators both at home, plus the State capital since 1843, there's more than enough in Nashville to keep anyone picking' and grinning'! And at the Hard Rock Cafe Nashville, the good-times tradition continues. Housed in the site of Nashville's first brothel, the building stretches half a block long and has an outdoor patio area so there's plenty of room for you and all your rowdy friends. 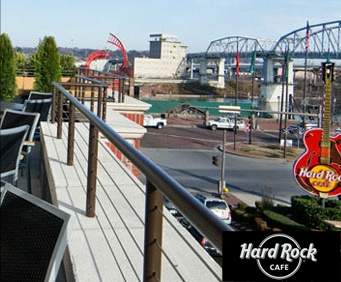 In addition, the Hard Rock Cafe Nashville underwent a complete renovation in the fall of 2009. The updated facilities include a live music venue, new bar, and a rooftop deck. 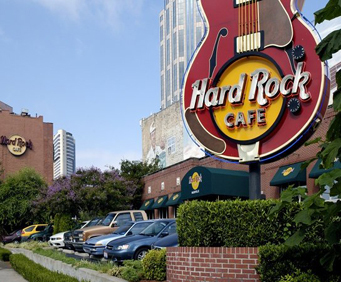 Located in the historic district of downtown Nashville, near the Nashville Convention Center, the Adelphia Coliseum and the Nashville Arena, Hard Rock Cafe Nashville is not just the heart of Countrypolitan, but also the heart of rock 'n' roll! "Service was above and beyond." Service was above and beyond. Very friendly. Best server we had. We had the caesar salad. Very good. We could take picture of all the memorabilia. Main course selection was very limited. Dessert selection was huge. Service was wonderful. What one would expect out of hard rock. We have been to ny and chicago and nashville compares well.